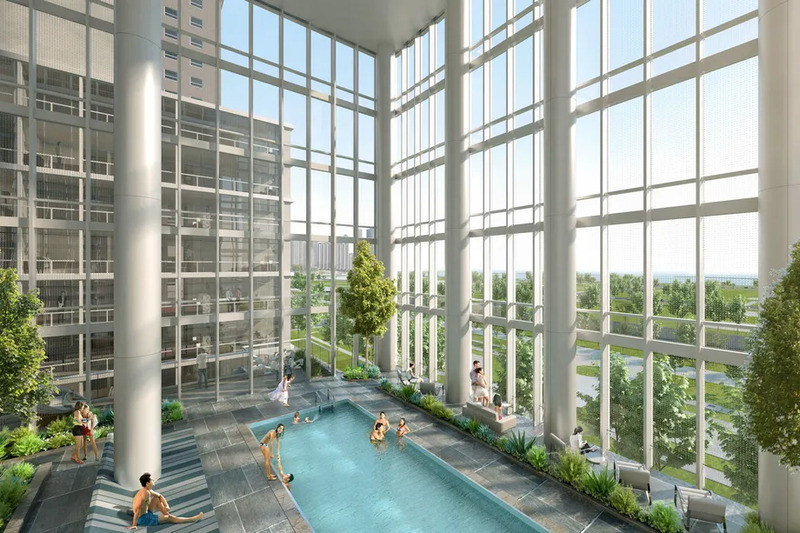 After nearly two-years of construction, Chicago’s Essex on the Park tower is starting to sign leases for its 479 apartment units on its way to an anticipated spring completion. The 56-story South Loop high-rise broke ground in early 2017. The project from developers Oxford Capital Group and Quadrum Global and Chicago-based Hartshorne Plunkard Architecture (HPA) replaces an unremarkable parking garage at 808 S. Michigan Avenue with a hard-to-ignore skyscraper wrapped in green-tinted glass. Building amenities include a dramatic four-story winter garden with an indoor pool overlooking Grant Park, an outdoor patio with grilling stations, a fitness center with an indoor/outdoor yoga studio, a party room, cocktail lounge, game room, and a private conference room. While the architecture of the building doesn't do much for us, the winter garden is one of the cooler concepts we've seen (judging by the pic above). Additionally, residents will have access to all of the services of the adjacent Hotel Essex. Previously known as the Essex Inn, the renovated hotel will offer a new restaurant and retractable-walled elevated bar when it opens later this year.